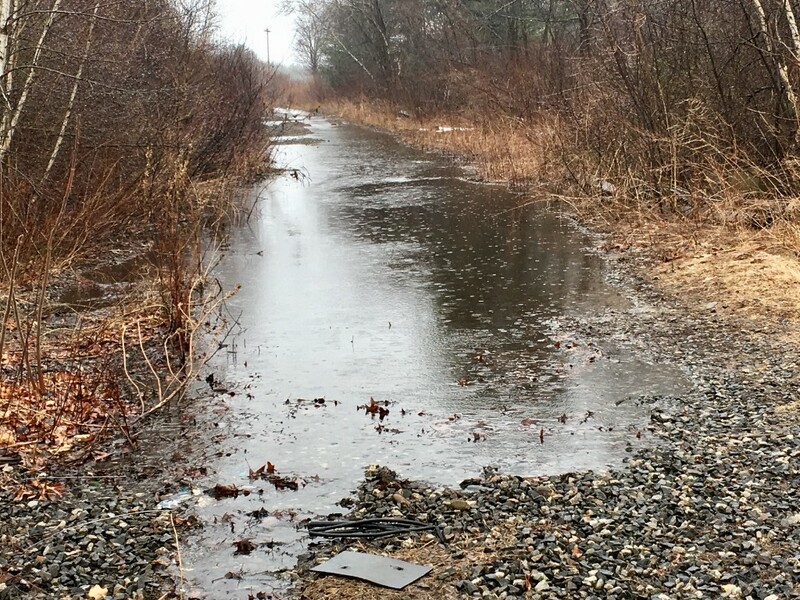 Photograph of unmitigated, overflowing toxins adjacent to Coakley Landfill Superfund Site, Greenland, NH. TO: Honorable Chris Sununu, Governor, et al. Scientists must continue to fight against the suppression of facts and scientifically-based information). Pursuant to RSA 126-A:73 (HB 511, Chapter 166:2, Laws of 2017), enclosed please find the Final Minority Report of the Commission to Study Environmentally-Triggered Chronic Illness. This Minority Report details and documents additional work of the Commission and important findings not covered in the majority report. (1) Determining which entities may report confirmed cases of chronic conditions or other health-related impacts to the public health oversight program. (2) Recommending ways to alert public health officials regarding higher than expected rates of chronic disease or other health-related impacts which may be related to exposures of unrecognized environmental contaminants. (3) Recommending a method to inform citizens regarding programs designed to manage chronic disease or other environmental exposure health-related impacts. (4) Recommending data sources and a method to include data compiled by a public or private entity to the greatest extent possible in the development of the public health oversight program. (5) Defining by codes, the health status indicators to be monitored, including chronic conditions, medical conditions, and poor health outcomes. (6) Studying current health databases, including years available, potential for small area analysis, and privacy concerns. (7) Researching currently existing health data reports by agency, bureau, or organization. (8) Creating a model of desired data outputs and reports for chronic conditions and other health-related impacts. (9) Identifying the gaps between what currently exists and the model output. (10) Recommending the organizational structure responsible for the oversight function and mandatory reporting requirements. (11) Collaborating with the National Institutes of Health, the United States Environmental Protection Agency, and the Centers for Disease Control and Prevention to develop protocols for the department of health and human services to educate and provide guidelines for physicians and other advanced health care practitioners to identify and evaluate appropriate diagnostic screening tests to assess health effects from exposure to emerging contaminants. (12) Collaborating with the National Institutes of Health, the United States Environmental Protection Agency, and the Centers for Disease Control and Prevention to develop protocols for programs to streamline education and outreach to health care providers about how to implement the guidelines specified in subparagraph (11). The protocols shall include education relative to methods to reduce further exposures and to eliminate the contaminants, if effective methods are available. The HB511 Commission was formed with the overall goal of reducing exposures in our environment that may trigger cancer and chronic disease in New Hampshire. According to the Centers for Disease Control (CDC), New Hampshire has the highest incidence rates of breast, bladder, esophageal (https://gis.cdc.gov/Cancer/USCS/DataViz.html),and pediatric cancers (https://www.cdc.gov/mmwr/volumes/67/wr/mm6725a2.htm#F1_down) of all US states. In addition, a double pediatric cancer cluster was identified in a 5-town area of the seacoast in 2016 (https://www.dhhs.nh.gov/dphs/hsdm/cancer/rms-investigation.htm). The work of the commission is to determine how to establish a data framework that would enable health and environmental officials to monitor areas of increased disease and illness that threaten public health in proactively before they become clusters. The model the commission is developing is meant to inform where areas of concern exist and where financial resources should be spent if these gaps are problematic. The goal is to communicate findings to the public and make concrete recommendations on how the state and citizens can reduce exposure to environmental agents that are thought to trigger chronic illness and cancer and improve outcomes. The charge of this Commission requires an inter-agency approach between the Department of Health and Human Services (DHHS) and the Department of Environmental Services (DES). This stumbling block to the charge of the Commission was identified early on and members sponsored enabling legislation that was signed into law in 2018 to compel the agencies to share data in order to accomplish the goals of the commission. The seacoast pediatric cancer cluster consists of statistically significant higher than expected rates of rhabdomyosarcoma (RMS) and pleuropulmonary blastoma (PPB) (Department of Health and Human Services Pediatric Cancer Cluster Investigation, February 2016), as well as, almost 3 times the expected rate of brain and central nervous system cancers in children in the same 5-town area. The double pediatric cancer cluster was reported to the New Hampshire Cancer Registry by Rye resident and HB511 Commission member Representative Mindi Messmer in March 2014. While the pediatric cancers have several inherited or genetic conditions that could predispose individuals to RMS and PPB, it is thought that environmental factors may trigger onset. The Commission discussed several environmental factors that may be contributing to cancer and chronic disease in New Hampshire from a variety of natural, industrial, and defense-related sources. According to the New Hampshire Department of Environmental Services, approximately 150 unlined landfills and 20 Superfund Sites exist in New Hampshire which are possible and proven environmental concerns. Drinking water, groundwater, surface water, soil and air contamination has been identified related to these and other sources of environmental pollution. PFAs contamination of drinking water supplies has been identified in Amherst (TCI), Rochester (Lydall), Brentwood (County Fire Training Area) and adjacent to unlined landfills across the state. Four of the largest drinking water supply wells on the seacoast have been shut down due to environmental contamination. Approximately 14.7 square miles of drinking water aquifer in the Merrimack/Bedford/Litchfield area is impacted from an airborne release by Saint Gobain and an approximate total of 64 square miles is potentially impacted. Residents across the state are currently drinking water from private and municipal sources with levels of arsenic and PFAs chemicals, at a minimum, above what other states would allow. Other releases of contaminants in private and public drinking water supplies have been identified across the state. With the high rates of cancer in New Hampshire and the fact that the pediatric cancer cluster was identified by private citizens, highlight the fact that the need to proactively address ways to reduce and prevent cancer and chronic illness. The committee organized on Thursday, September 6, 2017 and elected Representative Mark Pearson as Chair. The Chair appointed Representative Jeffrey Salloway as commission clerk. The committee met twelve times throughout the study period, and issued an interim report on November 1, 2017. The minutes and interim report are attached. Minutes, documents reviewed by the commission, the interim report and this final report are also available on the Commission’s webpage, here. The commission heard presentations from the New Hampshire Department of Health and Human Services, commission members, the Department of Environmental Services, the New Hampshire Insurance Department, and academic professionals. With the Charge of the Commission in mind, the commission organized its work into 1) developing a database of relevant reference information reviewed; 2) developing an inventory of relevant health indicators, and 3) developing an environmental and health data inventory. The following sections provide a summary of the Commission work. Documents reviewed during the Commission charge are summarized below (see website here). The Commission was tasked to define by codes, the health status indicators to be monitored, including chronic conditions, medical conditions, and poor health outcomes related to environmental exposures. In order to understand what information exists regarding environmental exposures that are likely to trigger public health impacts that should be included in the framework of the monitoring system, the Commission identified available information regarding known common diseases and conditions that may be linked to environmental exposures. 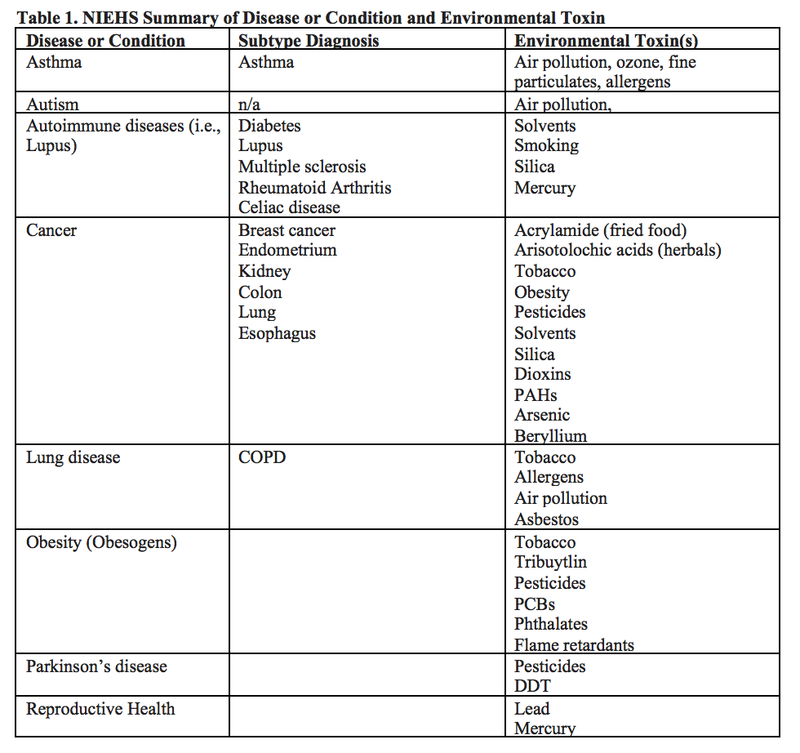 Diseases and conditions strongly linked to environmental exposures and associated environmental toxins recognized by NIEHS are summarized on Table 1 (see https://www.niehs.nih.gov/health/topics/index.cfm). The NIEHS lists chemicals or factors in the environment to which humans are exposed that may cause adverse health effects (see https://www.niehs.nih.gov/health/topics/agents/index.cfm). 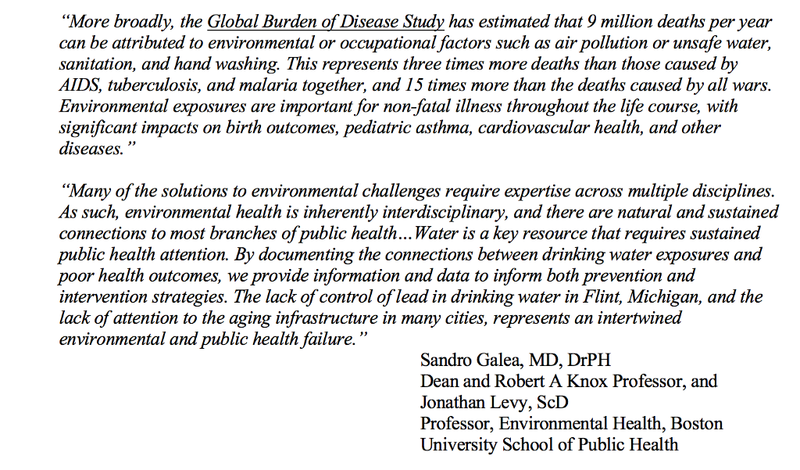 The Commission reviewed additional studies that determined probable links between exposure to PFAS and pregnancy-induced hypertension/pre-eclampsia, liver damage, increases in serum lipids, decreased antibody response, asthma, lower birth weight, thyroid disease, ulcerative colitis, decreased fertility, testicular and kidney cancer (https://www.atsdr.cdc.gov/toxprofiles/tp200.pdf and C8Sciencepanel.org). More recent studies suggest connections with breast cancer (Ghisari M, et al., 2017 and Bonefeld-Jørgensen EC, et al., 2014). The Commission also heard about the biomonitoring program currently underway consisting of collaboration between the NHDES and NHDHHS to assess the relationship between arsenic levels in drinking water and public health outcomes such as bladder and lung cancer. The program was implemented since New Hampshire has the highest levels of bladder cancer in the country. House Bill 1592 was passed into law in 2018 and will result in NHDES proposing a more stringent drinking water standard for arsenic by January 1, 2019 intended to reduce levels of exposure to arsenic in drinking water to prevent bladder, kidney, and lung cancer. 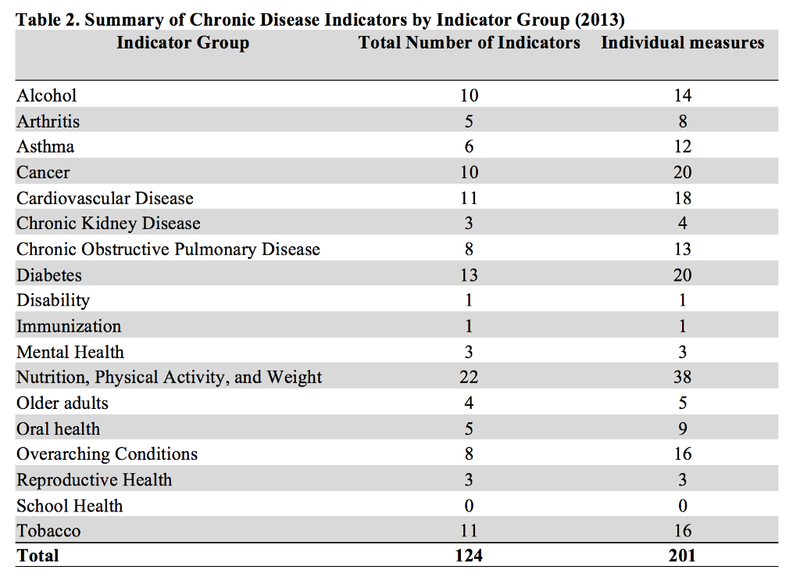 To conduct surveillance of standard chronic disease conditions, the Commission suggests using the chronic disease indicators (CDI) from the Centers for Disease Control and Prevention (CDC), the Council of State and Territorial Epidemiologists (CSTE), and the National Association of Chronic Disease Directors (NACDD) and the National Institute of Environmental Health Sciences (NIEHS). The CDI are a set of surveillance indicators developed by experts in the field for public health surveillance and are summarized on Table 2. The Chronic Disease Indicators draw on several federal databases including, but not limited to: Behavioral Risk Factor Surveillance System (BRFSS), State Cancer Registries, the American Community Survey (ACS), National Vital Statistics System (NVSS), Youth Risk Behavior Surveillance System (YRBS), Pregnancy Risk Assessment Monitoring System (PRAMS), Alcohol Epidemiologic Data System, National Survey of Children’s Health, Centers for Medicare and Medicaid Services Chronic Condition Warehouse, National Immunization Survey, and others. For more information visit the CDC Chronic Disease Indicators website: https://www.cdc.gov/cdi/index.html. This list of indicators may be refined in the future as the work of the Commission continues to evolve. 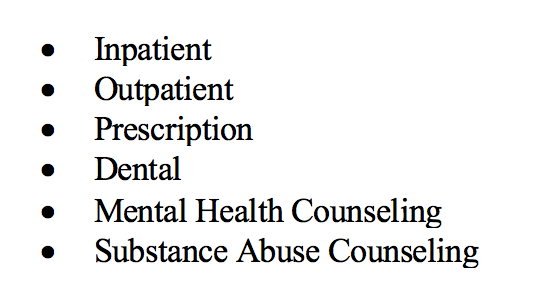 To conduct surveillance of standard neurologic conditions, the Commission suggests using the following standard case definitions (adapted from St. Germaine-Smith et al., 2012Recommendations for optimal ICD codes to study neurologic conditions. Neurology (79)) shown on Table 3. As stated in the review article, “To ensure the accurate interpretation of population-based studies with use of administrative health data (i.e., hospital discharge data), the accuracy of case definitions for neurologic conditions needs to be taken into consideration.” Other conditions that may be of interest are difficult to define due to too few validation studies. Examples of these rare conditions include cerebral palsy, Huntington disease, hydrocephalus, muscular dystrophy, spina bifida. The Commission focused on determining what data is already collected in the state that is relevant to the overall goal of creating a public health environmentally triggered disease monitoring system. The Commission investigated which entities report confirmed cases of chronic conditions or other health-related impacts. The Commission studied current health databases, including years available, potential for small area analysis, and privacy concerns and researched currently existing health data reports by agency, bureau, or organization. After its investigation the commission found that the following data sources held promise as elements for potential future integration in a system of environmental/public health data surveillance. For details on the release of data held by DHHS to the general public and to public health researchers, consult the Division of Public Health Services. The New Hampshire State Cancer Registry (NHSCR) is a statewide, population-based cancer surveillance program that collects incidence data on all cancer cases diagnosed or treated in the State of New Hampshire. Since its inception in 1985, the NHSCR has contracted with the Geisel School of Medicine at Dartmouth by the DHHS Division of Public Health Services and the Health Statistics and Data Management Section. In mid-1984, mortality statistics for the State of New Hampshire as provided by the National Cancer Institute showed that our population had experienced about 100 more cancer deaths than the national average each year during the period 1950–1979. This information led to the formation of a Coalition Against Cancer, established with the help of the New Hampshire Division of Public Health Services and the American Cancer Society, N.H. Division, Inc. Through the efforts of the Coalition and the passage of the Chronic Disease Prevention and Control Act, cancer was established as a reportable disease in New Hampshire. A contract between the Division of Public Health Services and Dartmouth College to establish and operate a statewide cancer registry was then approved by the Governor and Council. The NHSCR collects incidence data on all cancer cases diagnosed or treated in New Hampshire. As required by the NH Administrative Rules, the NHSCR currently collects data from hospital registrars in the larger hospitals in NH. Hospitals with fewer than 105 cases per year who generally do not have their own cancer registry are assisted by the NHSCR staff, helping these hospitals with some of their reporting duties. The NHSCR also receives case report from physician practices, free standing radiation oncology centers, pathology laboratories and other sources. In addition, the NHSCR receives case reports for NH residents who are diagnosed outside the state, based on interstate data exchange agreements. The NHSCR has an innovative, two-phase reporting system. The initial rapid report provides basic aspects of case identification and is submitted within 45 days of diagnosis. A definitive case report is transmitted within 180 days from the date of diagnosis, and includes more detailed information, such as treatment and staging information. Timely reporting is essential for registry activities. 1)The stripping of direct personal identifiers prevents directly linking the data with other data sets. 2) The reporting on small area incidence is restricted in order to protect privacy but may be possible. The Environmental Public Health Tracking program is investigation the potential future ability to utilize small area analysis. Strict policies and procedures have been developed to maintain confidentiality in disclosure of data. The New Hampshire Comprehensive Health Care Information System (CHIS) was created by NH state statute to make health care data “available as a resource for insurers, employers, providers, purchasers of health care, and state agencies to continuously review health care utilization, expenditures, and performance in New Hampshire and to enhance the ability of New Hampshire consumers and employers to make informed and cost-effective health care choices.” The statute also required that the New Hampshire Insurance Department (NHID) and the NH Department of Health and Human Services (NH DHHS) partner on the project. The same legislation that created the CHIS also enacted statutes that mandated that health insurance carriers submit their encrypted health care claims data and Health Employer Data and Information Set (HEDIS) data to the state. While the information in the CHIS dataset has been stripped of direct personal identifiers, it does include basic information in the enrollment record such as gender, date of birth and zip code. · Only DHHS can link the CHIS data to other data sets since it is stripped of direct personal identifiers. · The reporting on small area incidence is restricted in order to protect privacy. · Claims data is limited to care provided to the privately insured population and does not include care provided through the Veteran’s Administration, or to the privately insured living in NH but working and receiving insurance from carriers licensed out-of-state, or the uninsured. · Contract terms require NH Medicaid managed care organizations to submit to CHIS. · NH Medicare is also incorporated into CHIS format. Information in the WISDOM dataset has been stripped of direct personal identifiers, however, it does include indirect identifiers in the form of an assigned identifier number and basic information in the enrollment record such as gender, date of birth and zip code. · The stripping of direct personal identifiers prevents cross-referencing its data with other data sets. The LIMS system is the internal data system of DHHS’s Public Health Laboratories, which is used to store data accumulated in the course of a miscellany of programs. The Public Health Laboratories have been involved in testing for water quality in conjunction with DES’s methyl-tert-butyl-ether (MTBE) investigations, arsenic and uranium in conjunction with DHHS’s Biomonitoring Program, and DHHS’s lead poisoning surveillance. Information in the LIMS dataset has been stripped of direct personal identifiers, however, it does include indirect identifiers in the form of an assigned identifier number and basic information in the enrollment record such as address and zip code. The Commission heard from Dr. Christine Bean about the public health laboratory operated by DHHS. The laboratory analyzes samples for biomonitoring and data are stored in an internal system. Dr. Bean indicated that this data could be incorporated into the NHWISDOM dashboard. The Commission heard from Amanda Cosser about the biomonitoring program. The laboratory analyzes public and private water samples and the program is analyzing the connection between radon, arsenic and public health outcomes. Ms. Cosser indicated that this data could be incorporated into the NHWISDOM dashboard. The Department of Environmental Services Environmental Monitoring Database holds data collected through permitting, investigation and monitoring activities of the divisions of air resources, water resources and waste management. Data is collected through permitting activities and data monitoring required by state law, rules, and relevant federal statutes such as the Clean Air and Clean Water Acts. The public facing portal to the Environmental Monitoring Database is the website OneStop, maintained by the Department. The Commission was charged with recommending a method to inform citizens regarding programs designed to manage chronic disease or other environmental exposure health-related impacts. Additionally, the Commission was tasked with collaborating with the National Institutes of Health, the United States Environmental Protection Agency, and the Centers for Disease Control and Prevention to develop protocols for the department of health and human services to educate and provide guidelines for physicians, health care providers and other advanced health care practitioners to identify and evaluate appropriate diagnostic screening tests to assess health effects from exposure to emerging contaminants. The Commission was also tasked with identifying ways to develop protocols for programs to streamline education and outreach to health care providers about how to implement the guidelines discussed above. The communication methods identified would also include education relative to methods to reduce further exposures and to eliminate the contaminants, if effective methods are available. The commission gathered information relative to current practices, that the public concerns associated with those charges have been clearly communicated to the Departments, but that the further development of information and training protocols should be deferred until the synthesis of environmental and health data envisioned in the three-stage process recommended by the commission takes place. In addition, the Commission heard that there are some very real limitations on communication internally between state departments and with external data sources due to antiquated computer systems making interagency cooperation and data sharing challenging. The work of the commission is to determine how to establish a data framework that would enable health and environmental officials to monitor areas of increased disease and illness proactively before they become clusters. Examples of recent policy advanced in New Hampshire discussed in the Commission aimed to reduce rates of chronic disease and cancer include Senate Bill 247 (lead), House Bill 1532 (arsenic), and Senate Bill 309 (PFAs). Senator Dan Feltes presented to the Commission regarding SB-247 which will reduce childhood exposure to lead in paint and water. House Bill 1532 which will result in a more stringent standard for arsenic in drinking water was signed into law during the 2018 session. Katie Bush (DHHS) discussed the EPHT study being conducted through a federal grant to assess arsenic and bladder cancer. Senate Bill 309 was signed into law in the 2018 legislative session which will result in a rule making proposal for a more stringent and enforceable standard for five PFAS compounds in drinking water by January 1, 2019. A serious challenge for policymakers charged with protecting the public’s health is the difficulty of proving a link between exposure to an environmental contaminant and an illness. Where evidence exists of a link, scientists, courts, office holders and members of the public may disagree on the standards of proof. Policymakers in this area are therefore routinely faced with a decision; act now on uncertain evidence and risk wasting resources, or wait for definitive proof at the risk of continuing damage to public health. Public health scientists faced with this dilemma have developed the Precautionary Principle, which states that if we have some evidence that a risk factor causes a disease and if the disease has serious consequences and if the risk factor can be mitigated at reasonable cost to society and if mitigation does not further damage society — we should act — even if we are not totally certain. However, this leaves us to ask: if there is a substantial cost to mitigation — do we have the right to intervene based on uncertain evidence and demand mitigation? Professor Robert Woodward, a retired health economist from University of New Hampshire, presented to the Commission on the tension between the precautionary principle and cost effectiveness. Dr. Woodward reviewed his methodology for assessing cost-effectiveness of risk mitigations vs. the benefit of risk reduction. Assessing the cost paid by the reinsured is complex and includes assessing hospital costs, physician costs, lost days at work, and for caregiving. He compared the value of risk vs. the benefits of improving the environment. Quality adjusted life-year is a generic measure of disease burden, including both the quality and the quantity of life lived. It is used in economic evaluation to assess the value for money of medical interventions. One QALY equates to one year in perfect health. Dr. Woodward cited the need for small scale analysis; small geographical units to accomplish the Commission goal to identify and prevent environmental triggers for chronic illness. The Commission is charged with recommending the organizational structure responsible for the oversight function and mandatory reporting requirements. The DHHS provided the Commission with a legislative resource request to summarize staffing needs to establish a more centralized environmental health monitoring program within the DPHS. This would enable the Department to respond to emerging concerns and environmental health issues. This information is provided in Attachment C of the Majority Report. 3) Hold a presentation on the departments’ ongoing, joint efforts under the Centers for Disease Control and Prevention environmental public health tracking cooperative agreement. 4) Compile a report describing and estimating the cost to perform a pilot project between the departments on arsenic in drinking water, where both health effects and environmental data exist. As recommended by Dr. Woodward and Commission members, small area analysis and interagency cooperation between environmental and public health agencies is necessary to be able to build a framework that will allow public health officials to surveil, identify, and prevent clusters of chronic illness and cancer. Challenges include reforming the relationship between DES and DHHS to achieve these goals and overcoming infrastructure interoperability between departments. The Commission recommends the following three-stage pilot study process in order to further assess data gaps and challenges to overcome. 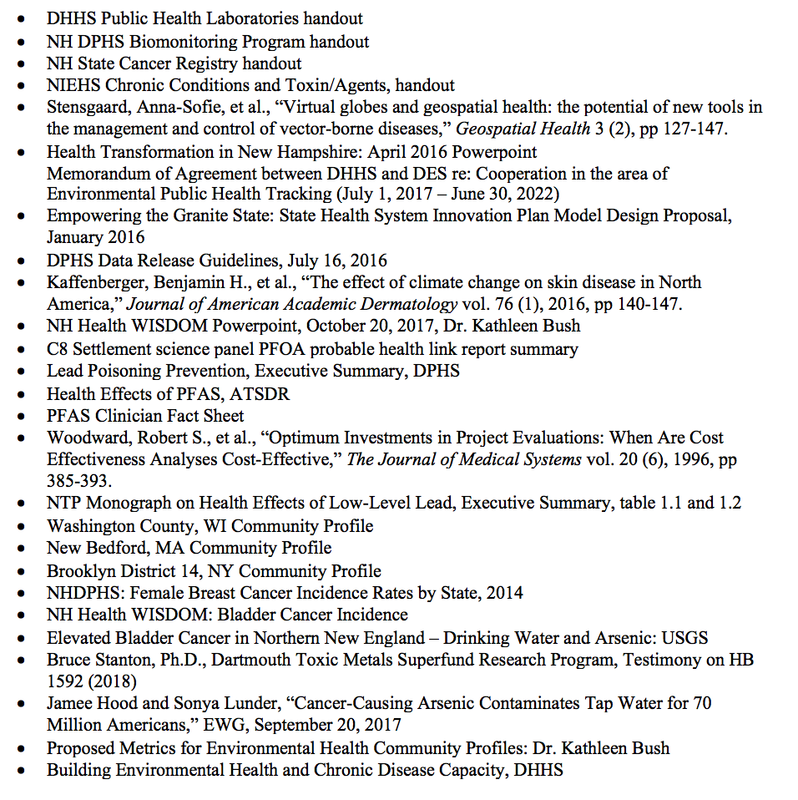 Building off of the lessons learned from the study, DHHS and DES will work with the legislature to propose an expanded review of environmental contaminant and health data sets and contaminants and/or disease focus areas. A cost/benefit discussion will be included in the proposal, as well as resource, methodology and funding required (via a fiscal note) to support the expansion. It is hoped that demonstration of value in Stage One would suggest possible federal funding options to compliment state funding. DHHS and DES will partner with academic institutions as well as federal agencies (EAP, CDC) to add academic environmental public health expertise to the design and implementation of the expansion (contingent upon funding and resources — IT and staff/contracted). Time frame for the proposal is within 6 months of completion of Stage One. Once the necessary resources and structures are in place, the informed expansion will commence and results will be reported out to the legislature (estimated to be available by July 1, 2020). Develop a comprehensive system of automated mapping and analysis, complimented by expert epidemiological investigation where there are indicators of adverse population health effects related to known environmental contaminants for a wide range of contaminants, would be proposed based on the success of Stage Two. State agencies would partner with New Hampshire academic institutions to strengthen the blend or research and surveillance in a robust ongoing and sustainable system. A cost estimate and a benefit assessment would be provided for the fiscal year 2022/2023 biennial budget. In its August 31st report, the DHHS noted that due to the absence of key staff, the interagency team could not currently complete the work on the pilot proposal at this time. The Commission was charged with recommending ways to alert public health officials regarding higher than expected rates of chronic disease or other health-related impacts which may be related to exposures of unrecognized environmental contaminants. The Commission heard that there are some very real limitations on communication internally between state departments and with external data sources due to antiquated computer systems making interagency cooperation and data sharing challenging. Updates to facilitate cross agency communication and data sharing would enhance the ability to carry out the Commission’s recommended actions. Another proposal is recommended for the next legislative session to continue the important work of this HB511 Commission. Ghisari M, Long M, Røge DM, Olsen J, Bonefeld-Jørgensen EC. Bonefeld-Jørgensen EC, Long M, Fredslund SO, Bossi R, Olsen J. Cancer Causes Control. 2014 Nov;25(11):1439–48. doi: 10.1007/s10552–014–0446–7. Epub 2014 Aug 23. Final Minority Report of the Commission to Study Environmentally-Triggered Chronic Illness was originally published in Less Cancer Journal on Medium, where people are continuing the conversation by highlighting and responding to this story.